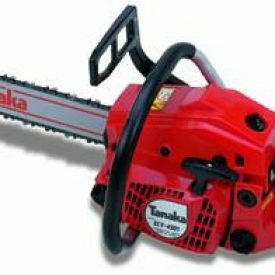 Additional Product Information for Tanaka Chain Saw model number ECV 4501-18" Kw 2.1, fuel tank cm3 400, oil tank cm3 245. Designed for full time professional forestry workers and for general applications. It has one of the best Kg/Kw ratio among similar saws in the market today. Dust rejection air-filtration system generating turbo force. Built-in decompressor - easy-start 70% less force required. Saw chain - Oregon No. 95VP-64E/72E.